What image comes to mind when you think of classrooms today? Where is the teacher and where are the students? Who is leading the discussion and doing most of the talking and moving in the classroom? For many, the image that comes to mind is that of a room of students, lined up in rows, with their attention directed to the teacher at the front of the room or involved in some activity at their desks. In this scenario, students are passively learning. Their involvement in class, in some cases, has them seated for the entire class period, while the teacher does most of the talking and moving around the room. In the past, this may represent the typical format of classroom instruction, however today, with a greater focus on flexible learning environments, and educators looking to promote student choice and voice, this image or perception of “what classrooms look like”, has changed and continues to evolve into a more active learning space, a place where students are empowered. A space in which students take a more active role, transform students from consumers to creators and the former teacher-centered classroom into a student-centered and student-driven space. Because students have typically spent so much of their school day seated, taking information in and do not always have time to ask questions, interact with peers, or do more than consume, they may become more passive learners. I started to notice this in my own classes. There was a decrease in student engagement, and reflecting on my methods I realized that I was spending so much time talking, that it was me making the decisions and leading all of our activities. There were not many opportunities for the students to work with peers, to move around, to really take control of their learning. In an effort to encourage students to become more active learners as well as to be more involved in the types of activities and instruction in the classroom, I started to implement some teaching strategies involving music and games. There are many benefits to getting students more actively involved in learning and this can be done quite simply through a variety of teaching strategies. It can be a challenge to change over from the traditional classroom lecture model, however, there are some easy ways to change to a more active, engaging space. 1. Game-Based Learning (GBL): GBL is a great way to add fun into the classroom and help build student excitement for learning. The use of gaming offers different ways for students to practice and develop their skills in more active learning environments. Games encourage students to learn and master content by problem-solving, collaborating, creating and engaging in more authentic and meaningful learning. It is a way to promote independent learning as well as by offering students choices in games to play and the means to work toward individual goals. 2. Tech: Students can create a game as a way to help themselves and their peers practice concepts and gain mastery. It can be a game created using one of the many digital tools available like Kahoot, Quizlet or Quizizz. 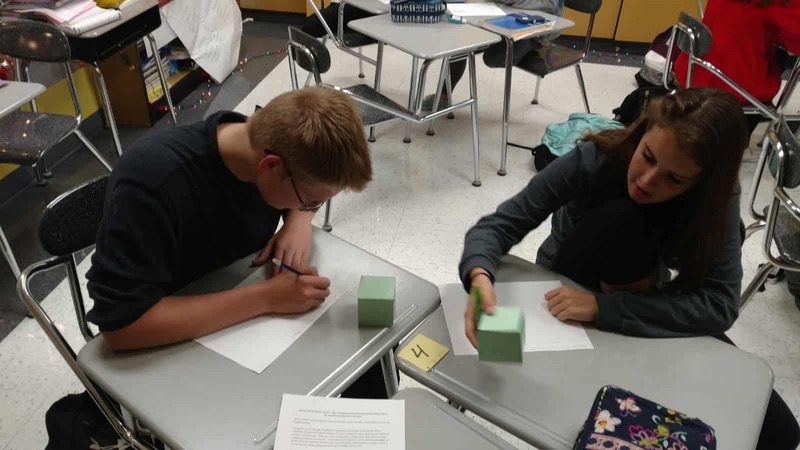 Students enjoy the opportunity to create a game, which leads to a more authentic learning experience when students select the specific vocabulary they need to practice, thus leading to more personalized learning opportunities. Students add to their skills by choosing how to leverage technology for the purpose of more self-directed learning. 3. No-tech: Students are very creative and offering them a chance to design a game to practice new content can lead to better retention and increase motivation. To get started, a few examples that can be used are to create a chart which includes 4 or 5 different categories or topics related to the content and grade level being taught. After deciding on categories, perhaps select 5 or 6 letters of the alphabet, or use numbers, which students must use to come up with a word, topic or date, that relates to each category. For example, in teaching Spanish, selecting categories such as classroom objects, verbs, colors, family and then deciding on the starting letter, students can brainstorm words and review in unique ways. Students can then randomly be assigned to small groups and then share the words their group came up with. An activity like this will promote communication between peers and provide an opportunity for collaboration and some fun as well. It can also be a good way to have students review, be creative and brainstorm new ideas. This creates time for teachers to assess student needs and decide the next steps in the lesson. 4. Music: Music livens up the classroom and is useful for helping students retain their learning. There are many ways to include music in learning, one just as simple as playing music when students enter the room, or while they work in small groups, to add to the culture of the classroom. As instructional materials, one idea is to have students create rhymes or a song using a vocabulary list, names of famous people, state or world capitals, monuments or anything related to the content area. Students can work in pairs or a small group and create a song which can be used as a mnemonic device, to help them retain the information in a more meaningful way. Students can then present live in class or use a tool like Flipgrid or Recap to record and share with classmates. These student creations add to the authentic classroom resources and engage students more in learning. In trying one or all of these activities, students have an opportunity to be more active in the classroom, work together, build relationships, collaborate and engage in more authentic learning experiences. Placing students in the lead provides the teacher with an opportunity to step aside and become a facilitator and use time in class as an opportunity to not only assess student learning but to interact more and provide feedback for students. There are many ways to build students skills in the classroom, and these are just a few of the ideas that we have been trying and they are a work in progress. Knowing that something works takes reflection and student input. With students creating more and working in small groups, I have more time to move around and work with every student and group and provide more individualized instruction. Students need to be moving in the classroom and have opportunities to learn in different formats using a variety of instructional strategies and tools, and it’s okay if they are not in the traditional format. I have really enjoyed getting to know the creators of Quizizz and being able to try some of the new features and learn about how they got started with this great learning tool. I am impressed with their dedication to creating a learning tool that will engage students in learning and offer more ways for students to engage in more authentic experiences. There is more to come from them, stay tuned! Quizizz has continued to improve and add new features over the past two years, especially with the option to assign games for practice, which students can do wherever they are, at any time. There is so much discussion and debate about the value of homework, and the “value” in having students complete the exact same assignment. Quizizz offers a better way to engage students in more authentic practice and be able to receive feedback available instantly. It is of great benefit for students to then be able to review their responses after completing the game. Learning opportunities like this are much more authentic than having students complete a traditional worksheet. Joining a game of Quizizz simply requires sharing a join code with students, whether it be during a live session or assigned as a practice game. Teachers can set up a practice game for students and extend the time period that the game is open, for up to 15 days, and if students start the game, they can resume at a later time by using the same login information. In addition to these ways of sharing the game, I was absolutely thrilled to find that I can assign the games directly to my students through Edmodo which is our base for our class. I had been sharing games by posting the join code on our class pages in Edmodo, and I had no idea that this option existed until I created the game for practice, and it showed up as an option. Let me just say that my students in the room wondered what happened because I jumped up and yelled “YES!” I really was excited to see this available. How does it work? When assigning a game for practice, you now have the option for sharing to Edmodo. When this is done, it creates an assignment where you can choose which class to assign it to, and you can also provide additional instructions. Once completed, it posts the game directly to Edmodo for students to access. This addition makes it a lot easier to share games rather than having to remember the join code or going back to search through the reports to find it. Quizizz also integrates with Google Classroom. Earlier this fall, Quizizz also launched their app, ZipQuiz, full of games to challenge friends in different content areas. Read about it in my prior post here. Thanks Quizizz for making the meme for me! Stay tuned for some new things coming from Quizizz, not going to give any details yet, but let’s just say, they’ve got some really great updates and features coming out very soon. Stay tuned!! These are just a few of the newer updates to some very popular digital tools. If you have not tried them, choose one and start there. See what your students think, and see how adding just one of these in can increase student engagement and provide more meaningful practice for students. One area that I’ve tried to focus on more in my teaching recently is collaboration, specifically how students collaborate with one another, and finding more ways to do this in class so that I can facilitate their learning. I enjoy having students work together within the same class because I believe in the value of building relationships and establishing a positive classroom culture. I also know how effective it is to take advantage of the time in class for students to become more familiar with each other and to work together towards a common goal. Understanding that not everything can be accomplished in a classroom is a big reason for this shift in my teaching–and this is where I believe that technology can be extraordinarily useful with a real sense of purpose. I have been using various tools over the past few years which have really opened up the possibilities of how, when, and where students communicate and collaborate. Our interactions are ​​no longer confined to being in the same classroom, let alone the same school. Collaboration can occur between students across the globe and does not have to be done synchronously. The nature of tools such as Padlet or Wikispaces for example allows students to collaborate on their own terms. Time and place don’t matter as much as purpose and connectivity. I recall driving home one day and trying to come up with innovative ways to have students create with the language. I liked the idea of projects, but wanted something more than simply having every student completing an individual project on the same topic. Each of my Spanish courses were at a place where I thought it would be great for them to do a project and work through learning in their own authentic way, so I decided to go big and involve the students from levels 1 through 4 as part of a team project. I didn’t have a clue how this would work, but it seemed worth figuring out. I hoped that something like this would bring students together and show them the power of technology for collaborating and putting a project like this together, so I gave it some thought and this is what I came up with: A cross-level, cross class team project. Here’s how it worked: Spanish IV students had been studying careers and planning for the future. Spanish III was focused on travel and preparing for a trip. Spanish II was learning vocabulary related to a community and and types of activities that one can do in a neighborhood. Spanish I was learning vocabulary for houses, chores and describing living arrangements. Taking all of these themes into consideration, I decided that one student from Spanish IV would be the ‘Team leader,’ and their ‘mission’ would be finding a job to apply for in a Spanish speaking country with the idea of going to work abroad. Team leaders also had to write a brief note to their Travel Agent, Community Specialist and Realtor (students from Spanish I, II, and III) to let them know their travel interests and needs they have for moving abroad. The team members would then take this information when creating their part of the project. Spanish III would then plan how their team leader was getting there. To make it more fun, I included a requirement that each Team Leader wanted a chance to sightsee before starting work, so the Travel Agent’s task was to plan a two-day tour that would meet the interests of their client. Spanish II would research the neighborhoods where the client would be living and let them know what types of services and businesses were available for their new community. Spanish I, with two members assigned to each team, had to prepare to real estate ads for the clients. Each group would take the information from the notes and try to cater to the needs of their client. There was a tricky part to this which was that I had to be out of school for a period of time. I was not there to oversee the work, however I use messaging tools like Celly, Voxer, and edmodo to communicate. The biggest tool I used, though, was the concept of collaboration among students. While I didn’t plan this wrinkle in the beginning, I started to see that I relied on them as much as they relied on me and one another. I distributed list of teams to each student. I put the team list on the board and left a space for the team leaders to put their link and their notes or however they saw fit to share this information. There were problems at first. Students said they did not have the link, or had the link but did not have access and a few other issues, all of which I had expected and told the students to send messages or leave a note on the board. Always plan for failure, and have a backup for your backup. 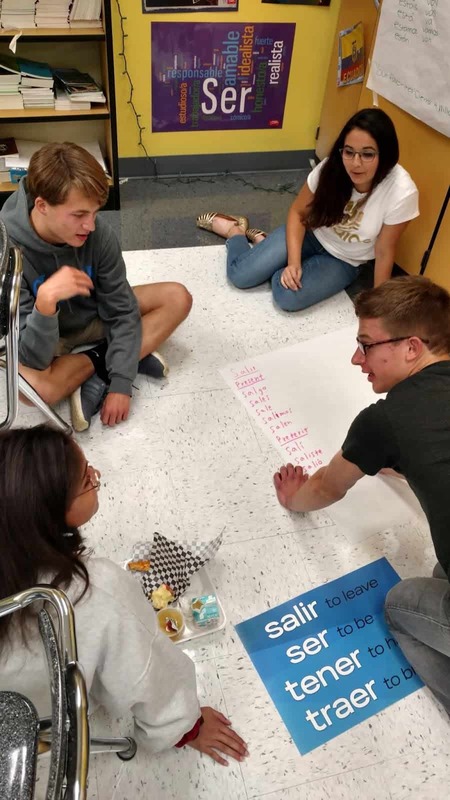 Ultimately, I wanted the students to practice the vocabulary in their respective Spanish classes, but I also wanted them to learn how to work towards a common goal and without having to be in the same physical space or during the same time. I wanted them to see what great resources are available through technology and how they can work as a team without being in the same place. The team leaders had the opportunity to say whether or not they really liked what the group members had put together for them, and for me it gave me another opportunity to let the students be creative, independent, to decide whatever they wanted to in terms of this project and that’s very important. Giving the students a choice in how they show what they know and can do with the material and being open to their ideas was crucial to the success of the project. When planning, keep in mind that even if things don’t turn out the way you had planned, if the critical objectives of the project are met (whether academic standard-based, soft-skill, or something else), then the project has to be considered successful. While planning is important and leadership essential, the tighter you hold to your vision of things as a teacher, the less ownership students can take over their learning. Teacher to Teacher: Does technology in the classroom help? Ask the students. This post was written by Rachelle Dene Poth and Sean, a student in one of her Spanish classes. Rachelle teaches French, Spanish, and STEAM at Riverview Junior-Senior High School in Pennsylvania. The availability of technology, and especially of digital tools like Quizlet, have opened up tremendous possibilities for classrooms today. Because of the diverse tools available, teachers now have new ways to deliver content both in and out of the classroom, and students have more engaging and personalized ways to learn. Sean, an 11th grader in my Spanish courses, has been an advocate for the use of technology at school. He recently led a presentation for an edtech conference, TRETC (Three Rivers Education and Technology Conference) and chose to present on Quizlet Live. He explained the purpose of the game, highlighted how to play, and led a game with those present — many of whom were playing for the first time. Sean had great, first-hand information to share and, coming from a student, the benefit of using Quizlet Live in the classroom was clear to everyone. Quizlet has a purpose when it comes to studying or just having fun. For example, in my Spanish II class, we used Quizlet for studying outside of class or to create cards for homework, and then when we met again as a class, we would play Quizlet Live and it would be fun for everyone. It is a tool that can be used multiple ways for school and work. An example of using it outside of school is when we were coming home from the PAECT student technology showcase. We were bored during the bus ride, so Mrs. Poth asked us if we wanted to play and we said sure. At the time we didn’t know any topics that could be played on Quizlet Live except for school topics, but we were introduced to some of the other topics that could played. We struggled with some of the TV trivia, which dated back to the 1950s, but we worked as a team and won the game. This activity showed our group that there were a variety of things that could be done using Quizlet Live. This school year, I have already created a Quizlet Live that my class has played and everyone loved it. I will continue to create more Quizlets to use and help out the class, and to also have a fun time at home. We will be presenting a session during our state technology conference, PETE&C, and in addition to the student showcase, we will take over a full session and teach teachers about these tools. The students will once again be the leaders and engage the attendees with Quizlet Live. I have always been a fan of technology and any time I learn about a new tool, I go straight to the computer if time allows, create an account and start trying to figure it out on my own. Or if I don’t have time, I will add it to my seemingly never-ending list of tools that I want to check out. Last summer, I came across CoSpaces. I had no idea what to expect other than knowing that the purpose was for creating and experiencing a virtual learning environment. I created an account, looked at the gallery of what was available, and tried to figure out exactly how to create my own 3D space. I am the type of learner who would rather struggle and figure things out on my own first. I think it is better as a teacher, to work through those struggles so that we can better help our students. If I’ve exhausted all of my efforts, then I will look for a help section or connect with other educators that I know have experience using the tool. Sometimes even simply posting a question on Twitter, or searching YouTube for helpful videos, will give the answers that I need. However with CoSpaces, I was determined to work through it on my own because as soon as I started trying it, I knew right away that it was something I would want to use in my new STEAM Emerging Technology course for the upcoming school year. And while I greatly enjoy learning from the students, I also enjoy being there to watch the student responses as they begin to figure things out on their own and have those “aha” moments when they realize that they’ve uncovered exactly how to do something. Better yet is when they share this knowledge with their peers and also teach me new things to do with what we are working on. My plans for using CoSpacesEdu were uncertain at the time, because I knew virtual reality was a topic that I wanted to cover in my class. My course is focused on STEAM and Emerging Tech. I had plans to help students develop some vital technology skills, starting with learning about digital citizenship and then adding on new tech skills as we progressed. I knew that many students did not have much experience creating with anything other than Microsoft Word or PowerPoint, if even these two. I also wanted to know the different possibilities for using CoSpaces in the classroom, so I spent some time looking at the gallery, I joined the community on Facebook and reached out to the CoSpaces team to see what additional information I could find. But while doing all of this I did manage to create my own project in which I added many random items and had a lot of fun creating. I was truly amazed at what I was able to do within my own “space”. The ideas started flowing for how I could use this in my STEAM course and also with my foreign language classes. I could foresee students who had to create items such as biomes or do a book report, or a science project using CoSpaces as a way to represent these by building their own space and environment to represent the story they were trying to recreate or to tell. Talk about creativity, imagination, innovation and critical thinking, and more all in one tool. As with my other projects this year with my STEAM course, I wanted to find a way to connect using this tool for our class with a learning target or project for another class. There are so many possibilities. While waiting for some feedback, I decided to offer a few different options for students to choose from after looking through the gallery. Consulting a friend of mine who is outstanding in the field of AR/VR, Jaime Donally, (@JaimeDonally) who gave me some really fantastic ideas for creating with CoSpaces. I was also fortunate to have a conversation with Manuela, who provided a lot of insight into the new features that CoSpaces would be offering. There are updates sent regularly with details about the new features and links to sample projects and helpful videos. So if you have not yet checked out CoSpacesEdu, I recommend that you do because I guarantee that you will find it has applicability for something in your classroom. And it is a tool that will further engage students in their learning. Once they have created their own project, they can then immerse themselves in their own environment with the use of the app on the iPad or installing it on their phone and having a headset to walk through their own environment. How cool is that! So for our first project in STEAM, I asked students to create three scenes in which they either told a story about a TV show, a movie or a book that they had read, or create a different type of a living space, or come up with their own focus, as long as they included the required number of elements into their project. Once they were finished, I had them share their link on a Padlet, so that all projects could be accessible and that students could take turns walking through each other’s environment. The students were excited and amazed at what they were doing. While looking at the gallery and playing some of the games were fun, being able to create their own space, walk through it and explore on their own was way better, according to several of my students. There are so many digital tools available today to promote student learning in the classroom. The task is in figuring out what you need for your classroom. What could benefit your students the most? Over the past year, I took as many opportunities to learn as I could, spending time gathering information from reading books and blogs, staying active through social media in Twitter chats, Voxer groups, and by attending many conferences, both physically and virtually. I created long lists of new ideas, new tools, and created new accounts for many digital tools and tried as many as I could. Technology can help give students a voice, where otherwise they may not be willing to or want to respond, especially within the traditional classroom space. Here are the tools that changed our classroom this year and why. A video response tool that can be used for many purposes including formative assessments, student reflections and for sharing student work with parents. One of the biggest benefits of using Recap is that it provides a comfortable way for students to connect with their teachers, to share their ideas, thoughts or reflections, in a way which promotes student voice. After using Recap with students for assessments, for providing their feedback to me about what they liked and did not like about class, and more, I could see that they were comfortable being able to speak freely, in their own space. I like being able to ask questions, provide different prompts, give feedback, and receive the daily reel that Recap compiles, to make reviewing it an easy process. I found out about Voxer after being invited into a group created for ISTE Denver 2016. It started with a group on Facebook, and led to the implementation of Voxer as a means to connect everyone, build excitement for the conference and much more. I was amazed with the diverse uses of Voxer, ranging from individual conversations, a specific topic focused chat focused, a book study and much more. Becoming more familiar with the different uses got me to thinking how I could use it as a way to be accessible to students when they needed help with assignments. I had already been using various platforms including a messaging app and an LMS, but thought I would try Voxer out with a small group of students. The students loved it and used it for a few Spanish projects and even on a personal communication basis. After some time reflecting, I thought it could probably be a good tool to use for speaking assessments and to get the students involved in having conversations in Spanish with each other. There are many uses for Voxer in general, but as an educator, it can be a good way to become more connected, receive and provide support for colleagues and students. Padlet, which is equated to being a virtual wall, kind of like writing on a bunch of post it notes, has emerged as quite the multi-purpose tool in my classroom. What initially began as a way to have back-channel discussions, emerged as a means to communicate with other classrooms on Digital Learning Day, to have students quickly research and post pictures for a fun class activity, to curate student projects for easy display in the classroom, and even for students to use to create a project which included activities and multimedia links. The uses keep emerging and I’ve found that sometimes it’s best to turn to the students for some extra ideas of how you can use some of these tools in your classroom. A tool for creating infographics, social media flyers, presentations and more, Piktochart has become one of the tools that my students enjoy because they find that it is easy to use and enjoy the options which enable them to really personalize and make their project authentic. I have used it to create visuals such as birthday cards, classroom signs, Twitter chat graphics, and also for creating presentations for conferences. Regardless of what your needs may be, if you want to give students an option to create something visually engaging, personal to their interests and which enhances their creativity, according to my students this is something that you should try. Several of my students who have been very hesitant to use anything other than traditional presentation tools through Google or Microsoft Office, have found Visme to be a tool which encouraged them to take some risks and try new things this year. Students had to create a timeline about their summer, or basically anything they wanted, as a back to school project. At first, several asked to use something different, but they quickly found how easy it was to create something and have fun in the process. Several students enjoyed it so much that they contributed to two blogs about the use of audio and the benefits of it for education as well as other areas. (hearing from the student’s perspective, and seeing them featured for their work was a great experience). So if you want to try something more engaging that promotes creativity, helps to build those vital technology skills and also lets students have fun in the process, then this could be a tool to try in the new year. You can create infographics, reports, presentations, social media flyers and more. It is an easy drag and drop tool, that encouraged those “hesitant” students to take some risks and try new things. Check out Visme’s video series for “how-to” information! This is one of the game changers in my classroom this year. After many years of using the same Spanish reader in Spanish III, I wanted to add to the learning experience of students by enabling them to see some of the locations described in the book. I had found many videos and magazines, but I found Nearpod to be a much better way to really engage students in the lesson. Not only did students enjoy the lessons because of the interactive nature of it, they were overwhelmed by the ability to become immersed in the virtual field trips and feel like they were in the places they read about in the book. I knew it was working when those students who were constantly watching the clock move were the last to leave the classroom. The only thing that made this better was when students created their own lessons and took over the classroom, becoming the teachers and giving me the opportunity to become the student and experience it from their perspective. There are many uses for this in the classroom: interactive lessons, multiple question formats, ability to upload content, assigning a lesson for practice and more. It is definitely worth taking some time to try out, even looking over some of the lessons available in the Nearpod library, and asking your students what they think. And the Nearpod for Subs is AMAZING! A tool that can be used for having students complete formative assessments either live in class or as practice outside of the classroom, and a great way for teachers to get students more involved and be able to provide real-time feedback so that they can continue their learning process. Formative is a tool that has gone through many tremendous changes and improvements throughout the course of this year which make it a great tool for teachers to use for assessing students. Formative is another tool that my students enjoy using because of the individual benefits of having feedback sent instantly and directly to them, being able to “show” their work or have their answers corrected immediately. It has been a way to create a more interactive classroom and also another tool which I have used to flip roles with students so that I could also learn from their perspective. It is something which students ask to use and which they are excited to tell others about, which is why I know that it is having a positive effect in my classroom. A way to involve students in game-based learning in the classroom and also to provide more personalized instruction, based on the feedback you receive when students participate in a live lesson, or when you assign it as a homework practice assignment. I have enjoyed seeing students create their own Quizizz games, which I have found provides more focused practice for the students because they choose the material they need to practice. Another benefit is that it also enables me to share these resources with the class and with individual students who may need some extra practice There are many features offered by Quizizz, and if time is lacking for creating your own Quizizz, you can gather questions and edit from all the public ones available. Try the game with your students and see what they think, and use their input to help plan the next game! The first time I created my own Buncee, I was amazed by the number of choices available for adding elements into my creation. I found myself thinking about how much the students would enjoy creating using it and having so many choices available. I have some students who like to “dab” every time they get an answer correct and so I quickly realized they would really love the fact that they could add a dabbing dancer into their presentation. I created a Buncee for our annual Open House and was able to record my voice and add extra elements in from the diverse library of choices. Being able to create a Buncee like this, is a great way to share the information with parents who may not be able to attend. I had students create projects with themes ranging fr9. om a medical chapter to a lesson on teaching verbs and more. Students love the choices and the ideas for how we can use this tool keep growing. But the best part of it is that it enables every student to find something to add into their project and to bring out their creativity. And it definitely builds confidence with a lot of fun in the process. A few years ago I found “Blendspace” and it was exactly what I was looking for. I wanted an easier, more reliable way to share some websites with students to use for practice during and outside of the classroom. I had been doing this, by typing the links on paper, but the problem was that deciphering the link (between i’s, l’s, for example) sometimes made it a bit challenging. So when I started using Blendspace, now “TES Teach,” it was simply as a way to put activities and resources into a lesson and share one link which would open an entire page full of possibilities for enhanced learning. But over this past year I have found many more uses for it, ranging from providing an asynchronous lesson, curating professional resources, storing student projects for easy presentation in class, and mostly for the simplicity of building a digital lesson full of multimedia resources, from scratch to share with students and colleagues. Creating a lesson is easy to do and can be done quickly when using the TES resources or when adding your own content. Students can also use it to create their own presentations and this is a great way for them to incorporate a variety of media and to have everything available in one “lesson” using one tool. Accounts are free and you can have students join your class through a “pin” or Google Classroom or through a link. Teachers can also look at the lessons available through TES Teach and try some in the classroom. Storyboard That is an online tool that is used to create storyboard and provide a way for students or anyone to tell a story in a comic strip presentation Style. You can create by choosing from so many different characters props background scenes comma speak Bubbles and so much more. It is easy for students to create as this work as a drag and drop tool. It is a lot of fun for students to be able to really personalize the characters and create a very authentic and meaningful representation of the story they are trying to tell. There are many characters and backgrounds related to specific times in history, you can change the color of the characters, their clothing, adjust their movement and more. It’s really nice for the students because they can customize so much according to their personal needs which really enables them to be creative and have fun and be more engaged in their learning. Another benefit is that by having an account with school, there are lesson plans and examples available that can really help to see how to integrate StoryboardThat into your classroom, or really into any type of setting, to communicate information in a more visual, creative and innovative way. Another nice feature is that students can use it to present in class and have it presented similar to a power point. Bloomz is a tool which I began using at the end of the past school year, to see how it could enhance my classroom and open up more communication with parents. Bloomz offers a lot of great features, integrates the features of a messaging app, LMS, an event planner and more. It even provides translation capabilities with translation into 84 languages. Teachers can quickly create an event, share permission slips, create a sign-up sheet, track RSVPs, send reminders, and share photos and videos with parents. Bloomz also enables teachers and parents to communicate instantly, privately, and as often as needed each day throughout the year. It recently added the features of a student timeline for building a digital portfolio to share with parents, as well as a behavior tracking program, for communicating about student behavior and providing positive reinforcement. Even with all of the great digital tools available, we have to make some decision about what will work the best for our classrooms. What is the purpose for the implementation of technology? In looking over this list, are there any that you think might help to enhance, amplify or facilitate student learning in a more beneficial way than what you are currently doing in your classroom? Determining the answer is the first step, as we know that using technology just to use it doesn’t make sense. However, when we use technology in a way that enables us to help students find their voice, discover more about what they want to do, what they can do and what they need help with, makes sense. These are some of the tools which helped my students and had a positive impact on our classroom and learning experiences this year. To get started with the new year and some of these tools, my advice is to simply choose one of these tools and try it out. See how it goes and be sure to ask your students for their feedback as well. Excited for the upcoming school year, I decided to start with some new ideas, teaching methods and digital tools. I wanted to continue using some digital tools from last year, but hoped to find different and more creative ways to implement them into the classroom. My motivation for this developed as a combination of time spent over the summer reflecting on the previous year, learning new things at summer conferences and through webinars, and engaging with groups on Voxer. But possibly the most impactful for me, was by obtaining feedback directly from my students. I used Recap over the summer to ask them what they enjoyed in class, what helped or didn’t help, and what they were looking forward to in the new school year. Student voice matters. There are many great resources available for educators to learn more about and implement PBL (Project based learning) in the classroom. To begin this with my students, I first did some research to prepare myself for this new learning experience. I started with the Bucks Institute for Education (BIE, http://www.bie.org) for guidance before implementing it in my classes. I wanted to be prepared so that I could help to guide the students, even though I knew that I would also need some support along the way. I carefully read over and took notes from the “8 Essentials for PBL” from BIE and also referred to several publications from ISTE for PBL. Other helpful resources were the weekly blog posts by Ross Cooper and Erin Murphy, offering advice focused on #HackingPBL, to be included in their upcoming publication, “Hacking Project Based Learning”, which will be published this month. Another helpful book was “Dive Into Inquiry” by Trevor MacKenzie, through which I enjoyed hearing his experience and sharing the helpful images of rubrics with my students. During this process, I was also fortunate to have conversations with these educators, and early on, Don Wettrick, author of “Pure Genius” spoke to my students about PBL and how to get started, giving them great information and asking thought-provoking questions to challenge them. We had a Skype call with Ross Cooper, who listened to and offered advice to several of my students on crafting their Essential Questions. The students even later got to meet Ross and Erin and talk about the Hacking PBL book. Taking all of this information in, I guided my students through each step in the process, with focus on the beginning stages of PBL. The first step is to decide upon the Essential Question. What is an Essential Question? From my research, I have learned that it is not something that can easily be answered by conducting a quick Google search or with a Yes or a No. An essential question requires more. It leads students to research and critical thinking, problem solving, independent learning, progress checks and reflection along the way. When focusing on the Essential Question, it is not readily apparent what the end result of the student learning experience will be. My students initially struggled with not knowing where their research would lead. An essential question requires more, leads to more student inquiry and should be something that will sustain student interest along the way. Rather than have students write their Essential Questions, I asked them to think about what they wanted to study and to share their responses through Recap. I found this was beneficial because they could think through and explain their thoughts, and I could provide feedback directly to them. Having the opportunity to see and listen to the students as they shared their interests enabled me to understand the motivation behind their Essential Question. This method was very beneficial for me. When we started our PBL, we decided to set aside Fridays as their “PBL” day, and they worked on it independently for the first 9 weeks. We had regular check-ins for updates and at the end, each student shared the product of their PBL experience, which could have taken any form, depending on where their research led them. One very unique way that one of my students decided to share the information was by using Recap. Recap is a great tool for having students respond or reflect and gives them a comfortable method for sharing information with their teacher and also peers if they choose. One particular student suggesting using Recap to record separate videos of the results of her PBL study on Argentina and the tango. Using Recap for this purpose was a really great way for her to not only share her information and the reasoning of how she crafted her Essential Question, but also her thoughts and steps taken along the way. Using Recap made it very obvious to the audience how excited and engaged she was as a result of having the choice to pursue learning about an area of interest and passion. Even without the video component, the audio itself was enough to inform and engage the listeners in her topic. I could tell that she had chosen an Essential Question which led her through a tremendous learning experience,with sustained inquiry and engagement, and had truly gone through the Project Based Learning process. Selecting this as the “public product” was a great idea, and it also provided her with something to reflect upon as well. Marina: For my recent Spanish PBL project I decided to use Recap! PBL stands for Project Based Learning which means we come up with a topic that we are interested in learning more about. The first step is to state our essential question, the focus of our research and then being to explore and expand our knowledge. Along the way we might have more questions come up that we may not know how to answer, so we keep searching, learning and expanding our knowledge to find answers to them. At the end of the PBL project we are basically an “expert” and we can share our findings with our class, in any way that we choose. For my presentation, I decided to use Recap. Recap is like no other tool we have ever used in our classroom and it is by far one of my favorites. Recap is a tool that allows you to record a two minute long video, to answer a prompt, share information, or anything you want. It allows you, as the student, to answer questions that your teacher or professor sends you and you can record yourself, with as many tries as you want and then send it right to your teacher. As a teacher you can create questions and send them through Recap to your students, allowing them to respond in the comfort of their home or anywhere to answer your questions and have a continuous chat with feedback. Or like I did with my PBL, you can just make videos by yourself, you don’t even need a question to be sent to you to be able to make one. I love using Recap because I feel comfortable at my house recording my thoughts and then having them on my account to show and share with my whole class. For my Spanish PBL product, I used Recap and recorded myself at home. I spent the time studying the Argentine tango and I was able to research my topic and prepare to make a couple of two minute videos to talk about and share what I had learned during our PBL. I didn’t have to worry about having to talk in front of the whole class and forget what I was going to say. With Recap it was stress free to present in front of my class because I pre-recorded it. My class absolutely loved it because it was so different than just using Powerpoint or some other web tool that they had seen before. So not only did they learn about the Argentine Tango, they saw they could use Recap in a different way. Recap is an amazing tool that can bring a whole new element to classrooms everywhere, at any time, because it is so simple and easy and not to mention a lot of fun! I really suggest it to students and teachers because trust me, they will love it! Thank you to Meghan and EdTech: Focus on K-12: Glad to be a part of this discussion. Two education experts offer up best practices for utilizing mobile technology. 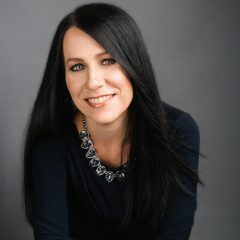 Meghan is an associate editor with EdTech: Focus on K–12. She enjoys following all the ways technology is constantly changing our world. With more and more K–12 students owning mobile devices, and with Pearson Education reporting that 72 percent of elementary students and 66 percent of middle school students want use mobile devices more in classroom, now might be the best time to add an app as a regular part of school work. However, as EdTech reported, a survey done by Kent State University’s Research Center for Educational Technology (RCET) found that 30 percent of general education had received training on apps, and 87 percent wished to receive some sort of training on mobile apps. We’ve consulted with a researcher and an educator who have expertise in adding mobile technology — particularly apps — into the classroom. For Rachelle Poth, a Spanish teacher at Pennsylvania’s Riverview Junior/Senior High School, using mobile technology in her classroom came out of a desire to provide easier and more accessible communication with her students. For Poth, the messaging app Celly was the perfect fit to remind students of assignments and provide a place to put class resources. For assessment: Quiz creation tools like Quizlet and Kahoot! Another way to figure out where an app might be helpful is by asking students, Poth says. Once educators have decided what they want in an app, they might get overwhelmed by the sheer number of options. Poth recommends reading teacher reviews and sample uses on a site like Common Sense Education or EdShelf. She also says you can chat with the communities on those sites or on Twitter to get feedback from other educators. At Kent State’s RCET, Karl Kosko, an assistant professor, and others are evaluating apps specifically for special education teachers as part of the SpedApps project. Their database can be accessed by all educators. Once a teacher has found the right app, he or she will need to do one more thing before introducing it to students: Test it. Perhaps the most important step of all for educators is choosing technology that supports their teaching and their curricula. Kosko suggests that teachers really think about how they are going to teach their students to use the app, and then use it for a purpose that will work in the classroom. Also, if using anything that needs technology at home, Poth says teachers need to be aware of what students have access to. “At the beginning of each school year, I give my students a paper and ask them what kind of device they have, if they access at home and what kind of tools they know how to use,” she says. Technology has created so many ways for teachers to provide choices for students, enable learning to occur anytime and anywhere, and to also be able to further differentiate instruction for the students. In addition to teachers being able to take advantage of the resources available to deliver instruction and assess students, these digital tools also create the possibility for students to take more ownership in their learning and become empowered learners. Rachelle and her edtech leaders! We need to offer diverse learning opportunities for students and to provide the support needed to encourage them to take more ownership in their learning and to become the leaders in the classroom. Students have to be more than just consumers, they need the chance to create, to experience learning from different perspectives and take this new knowledge and apply it in different ways to meet their needs. How do teachers know what is working in the classroom? Teachers can use assessment tools and monitor student progress, but it is far more valuable and important to classroom culture and growth, to work on relationships and build collaboration by asking students to be a part of the conversation and creation of class materials. When teachers do this, they understand what helps students to learn better, be more engaged, and have a more authentic learning experience. It also becomes a way to build student confidence and transform them into classroom leaders and advocates, who can then share their knowledge and experience with others in their class and then the community. At the end of last year, I wanted to see what students thought about creating these assessments using tools which were traditionally used by teachers to deliver instruction. Cassy shared her experience in the prior post and emphasized the importance of including students in the decisions of when and how to integrate technology. Because reflection is key, I took this information and thought about the logical next step. How could I share the message about Formative, or even more importantly, how could the students share their input with others, especially educators? 9th grader Cassy presenting Formative to teachers! Cassy: “On November 8th, 2016, I participated with two other students in TRETC (Three Rivers Educational Technology Conference) where educators and technology directors from the Pittsburgh area presented sessions on uses of technology. I am extremely grateful that I had this opportunity to share what I learned about and what I have created with technology. Formative was the perfect choice of a tool to share with the group of educators. I feel Formative is a wonderful, interactive and creative way to teach, complete assessments and increase engagement in teaching environments. I was very excited that I was able to inform others about this web tool because it means other students can have the same great opportunity I have been given, which is to use technology to learn and be creative. Cassy had teachers respond to a Show Your Work question and draw their own flowers! For the presentation, I created my own Formativewhich included a video, a true/false question, a multiple choice question, a short answer question, and a draw your response question. I included all of these so the group could see how many different options and aspects there are to Formative. I also explained the other possibilites with Formative, how to assign the Formative and answered any questions from educators or technology directors. One teacher asked if we (meaning my Spanish 3 class) have used Formative in the classroom. I told her that we have used it very often and I enjoyed it every time. I also explained how it is possible to see all of the responses of those participating in the Formative. While I talked about all of these great aspects of Formative and more, the group participated in the Formative I created and were able to see all of each other’s’ responses. The dynamic teacher-student duo showing educators how to act on live responses! I was very pleased with how the group reacted. I felt I had explained Formative well enough that everyone had a general, if not advanced understanding of how Formative worked and the advantages of using it. Seeing the smiles and hearing the laughter of everyone in the room meant that I had accomplished my goal of informing and sharing what I was so passionate about and making an impact with technology. I am so lucky to have had the opportunity to present at TRETC with my fellow students and my extremely talented and intelligent teacher. Mrs. Poth has opened so many doors for me and has taught me so much. Learning about tools, like Formative, has made me realize how useful technology is for learning. It was wonderful to hear what Mrs. Poth had to say about Formative on top of what I had to share about it. The group was able to see two perspectives on how Formative has impacted the classroom, which I felt made a very big impact. I admire her opinions and her comments. I am very appreciative that I could hear and see my fellow students and teacher talk about what they love so much about technology. Want to learn more about giving your students ownership over edtech and opportunities to present tools to teachers? Tweet to @Rdene915 or @goformative !